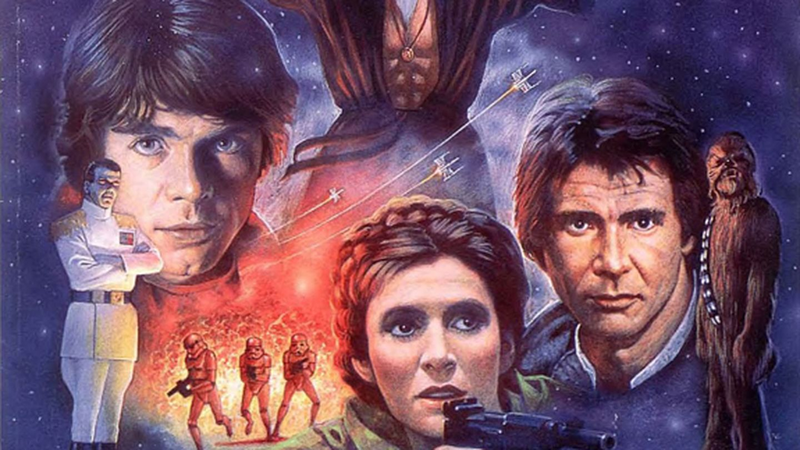 Now that we’ve seen Star Wars: The Force Awakens, we’ve also been seeing how a galaxy far, far away has changed from what had been put together by hundreds of authors over the last two decades. As we’ve learned a little more about the new world that exists post-RotJ, it’s clear that there’s more than a little inspiration from the existing material. Here are just a few of what has stayed the same: the Republic is named, Luke tried to restart the Jedi order, Han and Leia got married and had a child who then turned to the Dark Side, and the Empire continued to persist in fragmented remnants. But there could still be more! Here are some stories from the Expanded universe that could certainly be brought into the new continuity with little-to-no fuss and which could still possibly support the new trilogy. There’s a new rumor floating around that Supreme Leader Snoke is really Darth Plagueis, the Sith Lord that trained Emperor Palpatine. It’s probably a huge reach (where was he as Palpatine rose and fell? ), but there’s some interesting points to the theory. On the off chance that Snoke is Plagueis, Luceno’s book provides some good background on where he and Sideous/Palpatine came from, which really jumpstarts the entire era that the movies cover. Okay, this doesn’t have much to do with the post-RotJ world, but this decision always bothered me a little. These books were designed to fit closely with the prequel trilogy, and told some excellent stories; novels such as Matthew Stover’s Shatterpoint to Karen Traviss’s Hard Contact were excellent reads that contributed greatly to the larger Clone Wars fight. They’ve likely been eliminated because there’s some conflict with the Clone Wars television series, but nothing that hasn’t already been managed. The other unfortunate thing about this is that a lot of the novels, comics, and games help to support many of the minor characters—some of whom appear in the Clone Wars TV show, and are thus canon—which appear in the films. That said, there is one novel, Dark Disciple, by Christie Golden, which is part of the new canon. Originally conceived of as a loose trilogy featuring the principle heroes of the Star Wars films, one of the books, Kevin Hearne’s Heir to the Jedi, is actually in the new canon. The books by Wells and Corey follow Leia and Han respectively, and take place between A New Hope and Empire Strikes Back. Given that placement, it’s unlikely that there was anything to conflict with the new films, and they were each fun, standalone adventures with the goal of being open and accessible to new readers. When LucasFilm began working on prequel movies, they wanted to give their licensees a test run to see how well everyone could work together. The result was a multimedia project that involved a video game, a novel, action figures, comics, and a soundtrack: Shadows of the Empire. This book takes place between Empire Strikes Back and Return of the Jedi, and involves the dealings between Darth Vader and a crime lord, as well as Luke’s time after his traumatic experiences in the film. The timeline placement here makes this a good candidate to keep around, and it’s a fun story that introduces a whole bunch of new, interesting characters. Following the successes of Timothy Zahn’s Heir to the Empire, Kathy Tyers was given the job of following up Return of the Jedi. The Truce at Bakura takes the three heroes from Endor to Bakura, where an Imperial garrison is under attack from a strange alien species bent on stealing their life energy to power their machines. It’s an interesting book that shows off a bit of the strangeness of the Star Wars Universe. This novel has been replaced in the timeline by Chuck Wendig’s Aftermath, which helps to set up the new universe, but it doesn’t seem like the books would conflict all that much. This is where we start to get into some tricky territory, because we don’t know all the details that have been laid out for the new canon. But, it’s clear that the New Republic was established, and that they became a legitimate government as the Empire fell. It strikes me as plausible that Rogue Squadron will remain in the canon somewhere, helping to fight the Empire, one battle at a time. Stackpole’s novels are a great amount of fun, and maybe they could fit in somewhere. If not, maybe we can get a new set of starfighter adventures. What’s more interesting though is the state of the Empire. As we see in TFA, the First Order isn’t the Empire—it’s a perverted remnant of it, holding on to its own territory. That’s essentially what the EU portrays: the fragmentation of the Empire, particularly in the pre-Thrawn books. In this novel, we see that happening, and it seems to line up a little with what the film ends up with. These books are the biggest reach, because we don’t know a couple of key details, post-Force Awakens. We know that Kylo Ren is essentially Jacen Solo, but we don’t know who Rey really is. It’s unlikely that she’s Han and Leia’s daughter, but on the off-chance that that happens, it’s possible that Zahn and Anderson’s novels could fit somehow. These novels portray that Han and Leia are married and have twins, which is probably the main reason for why they were booted from the canon in the first place. That said, there’s other similarities—we see the rise of a fragment of the Empire, the formation of the New Republic and Luke’s new Jedi Order, and all that goes along with that. Everything after this point really relies on Han and Leia’s children, because they’re closely followed after their birth and childhood. If Kylo Ren is really an only child, then these books are out. After these novels, we’re clearly going into directions that really diverge from the path that the films have taken.